As day 4 commences, the trend for this day seems to be old rivalries reignited. The B-block was already the block to keep n eye on due to fan favorites all being together, however, the stakes are higher due to new developments and feud possibilities. The G1 has always been front and center when it comes to deciding the second half of the year, and with everyone in the blocks seemingly tied together in a way or have feuded before, or faced before, the matchups could be boring. However, the wrestlers are that talented that they'll keep you engaged no matter how many times they clash. Let's see how day 2 of the B-Block is looking, along with predicting each outcome of the bouts taking place. A fun match-up should set the tone for this day. Juice Robinson's style is very flamboyant and sporadic, but his character and mannerisms make him very popular with crowds around the globe. With his recent retrieval of the IWGP US Championship, and being the first American to hold the belt, he has got a lot of momentum heading into the round-robin. However, a broken hand could be serious and prove to be a heavy weakness. Ibushi is the current favorite to win the whole G1 Climax, in order to set up a match with Kenny Omega at Wrestle Kingdom 13, despite the two meeting on the final day of the G1 in the Nippon Budokan, the place the two last faced each other, 6 years ago. Ibushi's highflying, striking ability and speed, mixed with Juices more brawler, high impact style it should be sure to be great. Prediction- Kota Ibushi. 'The Golden Star' should win this and collect 2 points. A loss for Juice from Ibushi won't affect his standings and if Ibushi does fail in winning the G1, he at least could have an opportunity at facing the US Champion at Power Struggle or Destruction. The last time this match happened was in 2016, in the G1 Finals, where Kenny Omega won and became the first Gaijin(Foreigner) to win the tournament in its current format (In the old format it was Andre the Giant). This time, however, the two men are both champions. Goto is the NEVER Openweight Champion in his 3rd reign, whereas Kenny Omega is the IWGP Heavyweight Champion in his first reign after ending the momentous 720-day reign of Kazuchika Okada. The last time the two faced, they'd gone through hell, especially Omega as it was his first G1 last time the 2 met. Kenny and Goto have both developed in the 2 years, Omega more than Goto, but Goto is still a veteran who is not to be taken for granted. Prediction-Kenny Omega. Omega is winning again against the man who always fails to win the big one. Omega is on an elevated level now and with recent reconciliation with Cody, Hangman and Marty Scurll, he is now greater than before and can only be beaten by someone worthy and without a title. 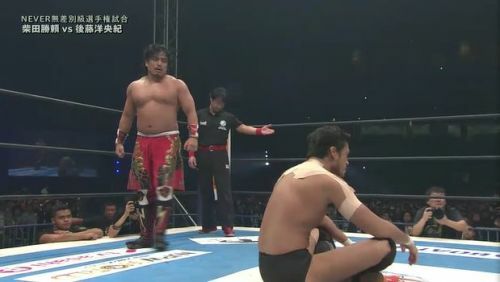 Unfortunately, Goto holds a title and is not worthy at the moment. I could potentially see him winning the New Japan Cup again in order to challenge but I doubt it.